For four years, I destroyed my very essence in trying to make a relationship work. A relationship that became doomed the moment I threw my passionate, highly emotional self against a rational, sensible other being. It was a maladaptive, damaged relationship in many ways, stemming from nothing substantial, based on addiction and crazed by my inability to cope with loss and abandonment. I lost a lot more than I am willing to admit in the process: it cost me my studies, wrecked my mental health and probably made me miss a handful of awesome opportunities. I was very aware of this all along but couldn't bring myself to let go. I suppose that I was willing to accept this in a certain way but then it happened. It happened on one of my runs, I was anxiety-ridden, consumed by the idea that I couldn't make him love me, trying once more to understand this nonsense that was our bond, my mind was processing so much and my brain was under so much stress that I dissociated. My body became completely disconnected from my mind and I could feel my conscious higher, like floating 30 cm above my head (and for the first time experienced what it's like to be tall, man this is strange...), it lasted for a minute or two that felt like one hour, it was then (well, after I was brought back home safely, and this is why you should always run with your phone) that I decided to stop destroying myself. I decided to simply let him where he wanted to be and move forward on my own journey, which I have been doing more or less successfully for the past months. As much as it's excruciatingly painful to let go, I have to believe in the fact that there is as much waiting ahead of me, even though my vision is still blurred. Those four years stroke a blow at my essence, but I have taken it back from the person I had entrusted it with and even embellished it and gained so much insight and even though my heart's cracks open a little every time I think of him, even though I'm in anxiety's thrall pretty much all the time, I am so grateful for being a passionate, oversensitive being, trusting and caring too much because that's how I believe we should live, taking it all in. As most of my recipes, they're fairly simple but feel free to add spices and other herbs. I dehydrated them but you could try to bake them in an oven. 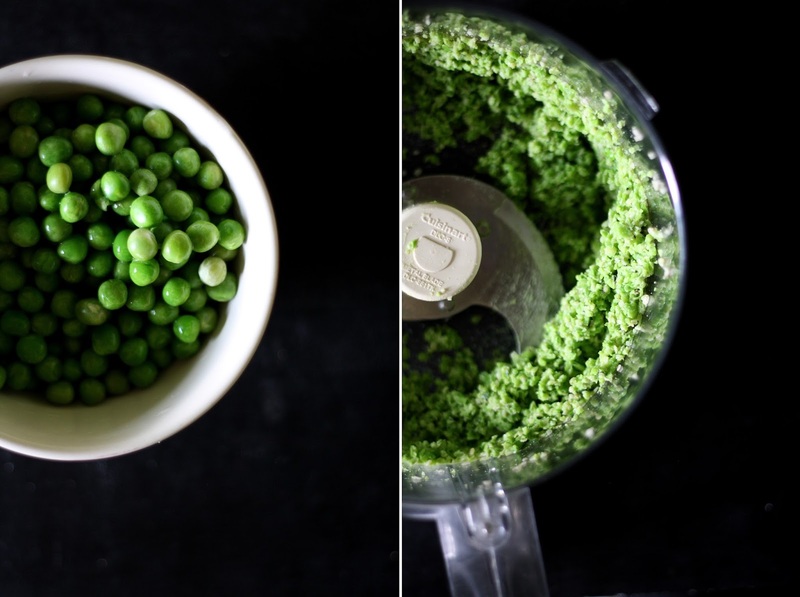 In a food processor fitted with the S blade, process peas with hemp hearts and coriander leaves until combined. Transfer into a bowl and add in the pea protein powder. Mix well, season according to your own preferences. With the palm of your hands, form small balls adding a little protein powder if it's sticky. Dehydrate at 40°C for 65-70 min. This makes moist balls, if you want them dry, dehydrate for longer. 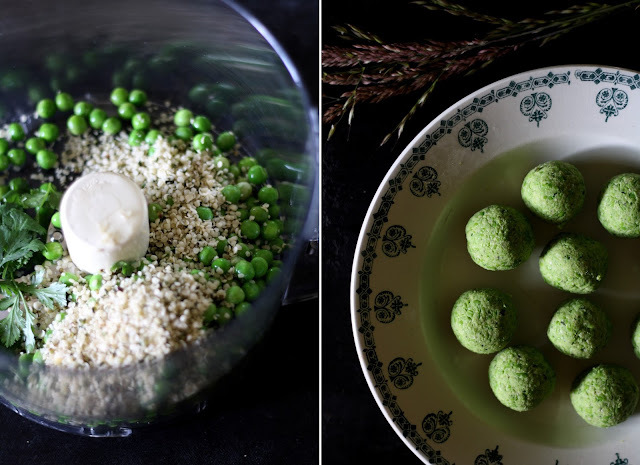 Mixer les petits pois, les graines de chanvre et la coriandre dans un robot avec la lame S. Dans un bol, mélanger la mixture avec l'isolat de protéine de pois, assaisonner selon vos envies. Avec les paumes, former des boulettes (ajouter un peu d'isolat si la pâte colle trop). Déshydrater à 40°C pendant 65-70 minutes. Cela donne des boulettes assez moelleuse. Pour des boulettes plus sèches, laisser au déshydrateur plus longtemps. 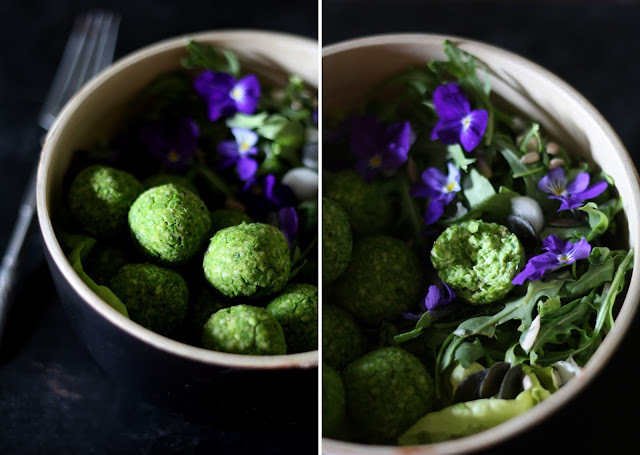 Bonjour, belle couleur pour ces boulettes mais je ne connais pas le pulsion ni l'isolat de protéine de pois .. par quoi est ce remplaçable??? Bonjour, c'est de l'isolat de protéine de pois, une sorte de protéine en poudre. On peut la remplacer par une autre protéine en poudre (soja, riz...), de la farine ou de la fécule!